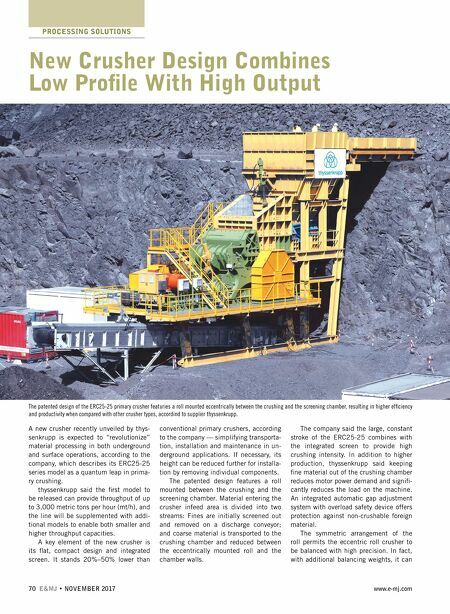 70 E&MJ • NOVEMBER 2017 www.e-mj.com PROCESSING SOLUTIONS A new crusher recently unveiled by thys- senkrupp is expected to "revolutionize" material processing in both underground and surface operations, according to the company, which describes its ERC25-25 series model as a quantum leap in prima- ry crushing. thyssenkrupp said the fi rst model to be released can provide throughput of up to 3,000 metric tons per hour (mt/h), and the line will be supplemented with addi- tional models to enable both smaller and higher throughput capacities. A key element of the new crusher is its fl at, compact design and integrated screen. 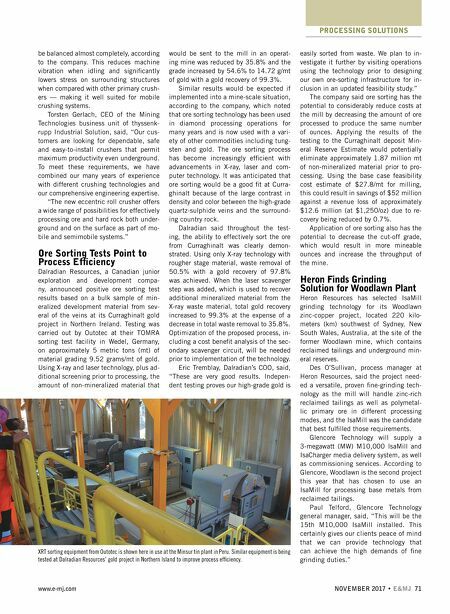 It stands 20%–50% lower than conventional primary crushers, according to the company — simplifying transporta- tion, installation and maintenance in un- derground applications. If necessary, its height can be reduced further for installa- tion by removing individual components. The patented design features a roll mounted between the crushing and the screening chamber. Material entering the crusher infeed area is divided into two streams: Fines are initially screened out and removed on a discharge conveyor; and coarse material is transported to the crushing chamber and reduced between the eccentrically mounted roll and the chamber walls. The company said the large, constant stroke of the ERC25-25 combines with the integrated screen to provide high crushing intensity. In addition to higher production, thyssenkrupp said keeping fi ne material out of the crushing chamber reduces motor power demand and signifi - cantly reduces the load on the machine. An integrated automatic gap adjustment system with overload safety device offers protection against non-crushable foreign material. The symmetric arrangement of the roll permits the eccentric roll crusher to be balanced with high precision. In fact, with additional balancing weights, it can New Crusher Design Combines Low Profi le With High Output The patented design of the ERC25-25 primary crusher featuries a roll mounted eccentrically between the crushing and the screening chamber, resulting in higher effi ciency and productivity when compared with other crusher types, accordind to supplier thyssenkrupp.